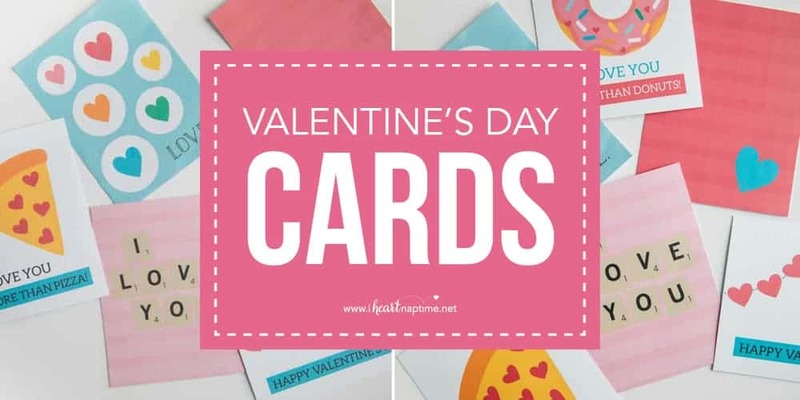 FREE Printable Valentine’s Cards – Skip the store-bought cards and use these fun printable Valentine cards! 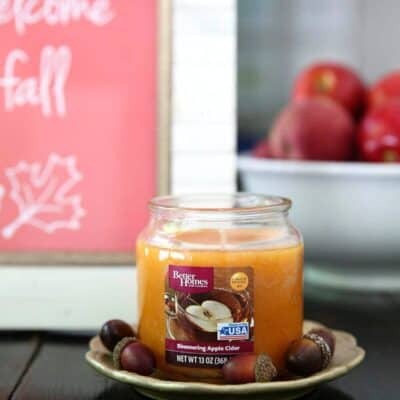 They are perfect for your significant other, family or friends. 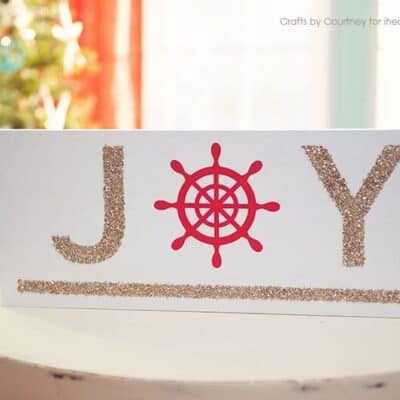 Your Valentine will love the personal touch that these homemade Valentine’s cards give! A Valentine’s gift isn’t complete without a sweet Valentine’s card. 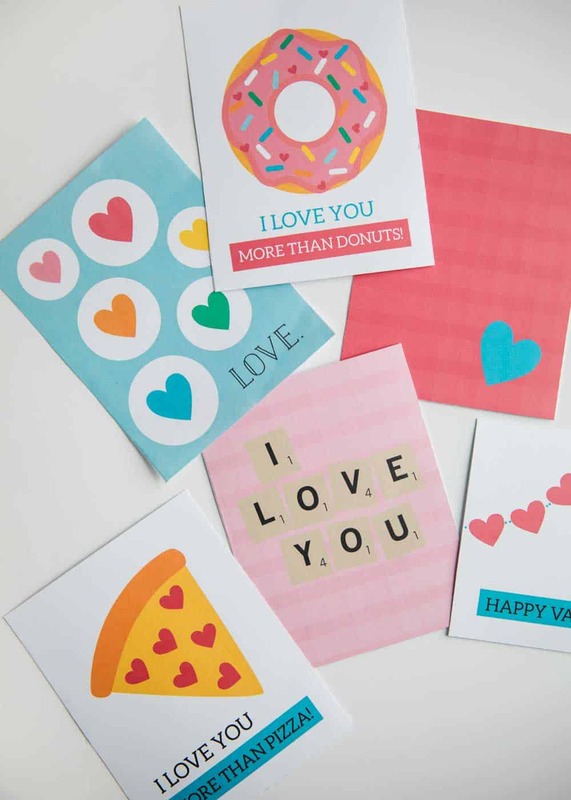 These homemade Valentine cards add a thoughtful touch and are so easy to print out. Pair the cards with a homemade treat like chocolate covered strawberries, chocolate truffles or no-bake cheesecake to make the perfect homemade Valentine’s gift. I can’t believe Valentine’s Day is almost here! It’s one of my favorite holidays and is so fun to celebrate. Sometimes it’s hard to find the perfect Valentine’s card at the store, so I thought I’d create some cute card designs that you can easily print out at home. 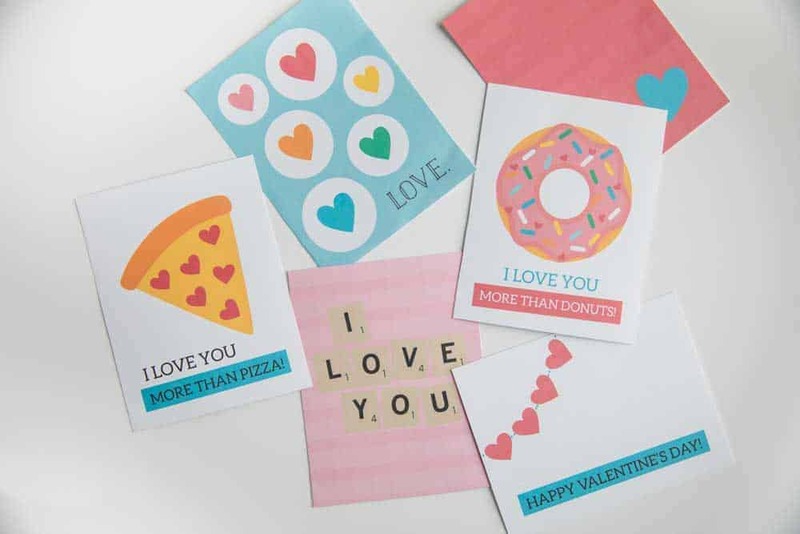 Pair one of these homemade Valentine cards with one of the cute candy Valentine’s tags below and you”ll have an easy and thoughtful gift in no time. I hope you enjoy! I’ve also included a version for kids, too! 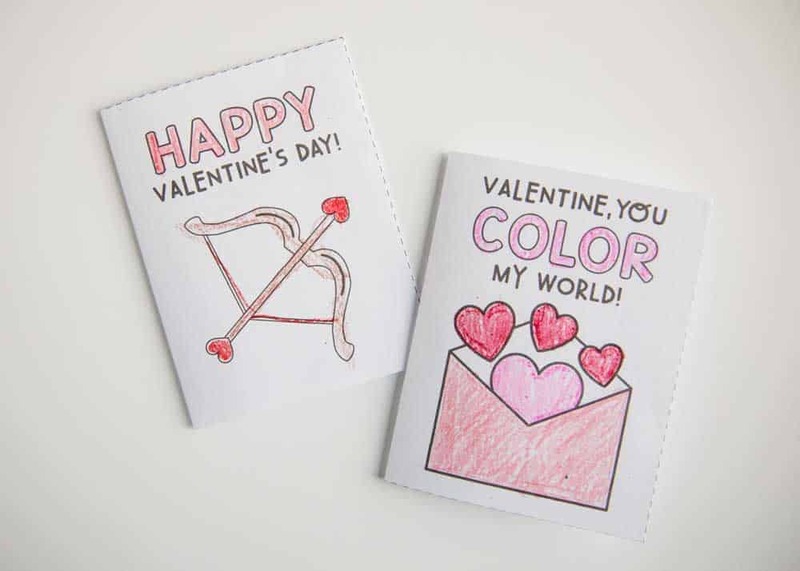 These kid’s Valentine cards are so fun for kids to decorate and add their own creative touch. 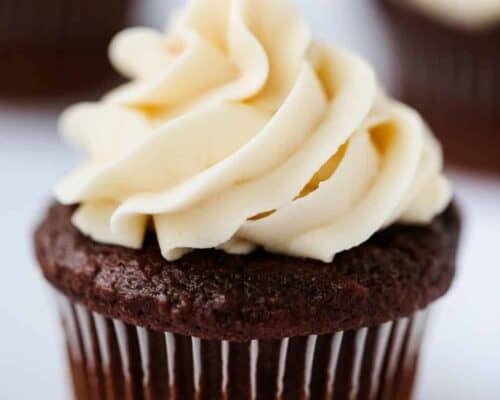 They are perfect to give to classmates, parents, teachers, you name it. There are also a few other Valentine’s coloring pages included in the printable download, like tic-tac-toe and other coloring designs. I’ve also included these cute printable Valentine tags! 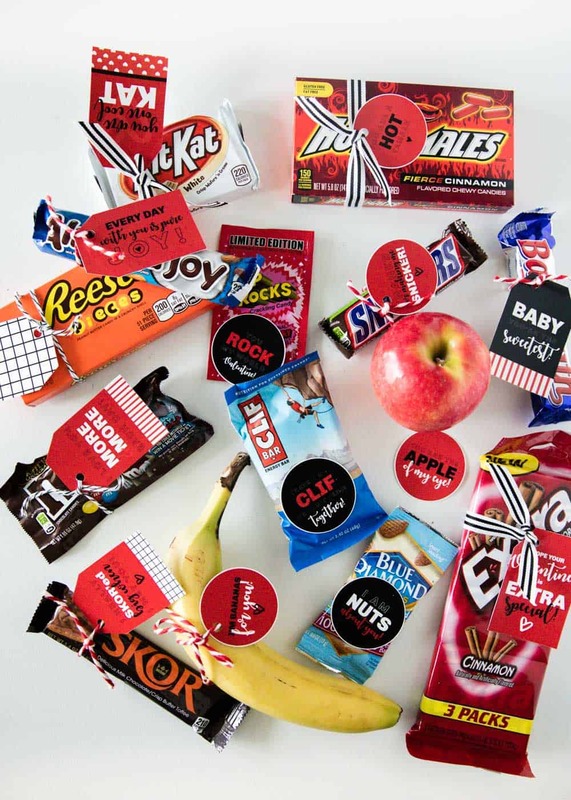 Each tag pairs with a specific candy bar, snack or fruit. 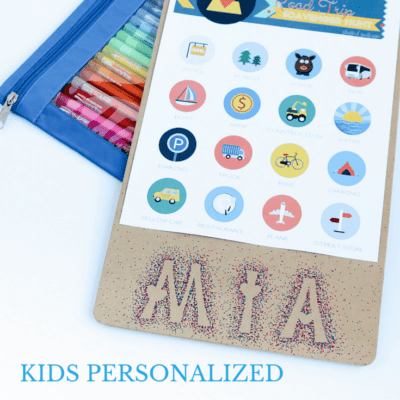 They are so fun and make such an easy and thoughtful gift for Valentine’s Day! Big Hunk: Happy Valentine’s Day, Big Hunk! Reese’s Pieces: I love you to PIECES! M&M’s: I love you More & More each day! Skor: I really SKOR’ed big when I met you! Baby Ruth: Baby you’re the sweetest! Snickers: Thanks for making me Snicker! Pop Rocks: You rock my world Valentine! Almond Packets: I am NUTS about you! Clif Bar: There’s no CLIF we can’t climb together! Banana: I’m bananas for you! Apple: You are the APPLE of my eye! 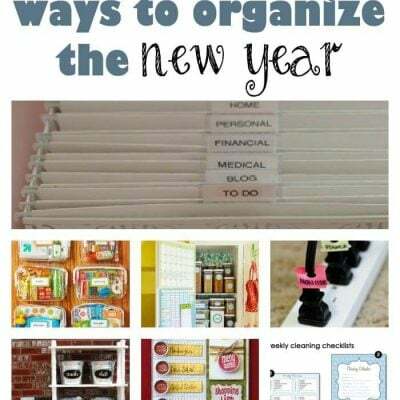 15 ideas for organizing the New Year! I love all the fun candy inspired cards! I love watching your short videos!!! they are super quick but informative…. these are adorable for valentine’s day! a great way ya to show your loved ones you care! These are so fun. And way more economical than store bought! I love the donut one! 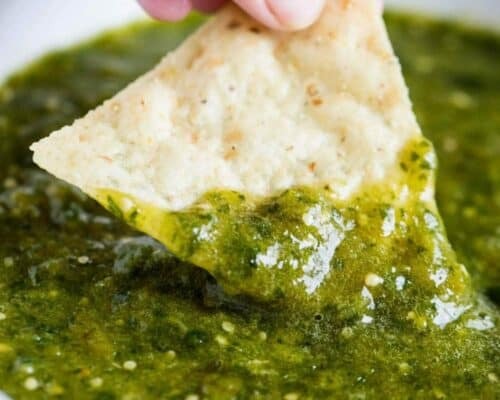 So many awesome valentine’s day ideas in this post! I love the printables for the hubby!